When people see your posts on social media, or land on your website, or receive your emails, are you getting their attention—or are they tuning you out? No matter what digital channels you’re using, so much of your success comes down to the quality of your content. To grow (and maintain) your audience, you need to create and distribute content that people will actively seek out, eagerly consume, and happily share. Contact us to discuss your content marketing needs. Creating high quality content takes work. But, the good news is that you can repurpose it across all your online channels. For example, when you make a great video, you can post it to your YouTube channel, optimize it to be found on Google, embed it on your website, share it on social media, feature it in an email newsletter, send it to bloggers and influencers, and earn valuable links to your site. That one video just did a lot! Our team will work with you to develop a content strategy that supports your overall digital marketing goals. And we offer a range of options to help you create that content, including writing, editing, graphic design, training, and consulting. We can also help you share your, through social media, PR, email, and other channels. We’ll work with you to create a content strategy that’s tailored to your goals, your audience, and your capacity. Usually this ties to SEO, as we identify the best opportunities to reach people who are searching for what you offer. Based on your target audience, we’ll advise you on the best media to use and the best channels for distribution. Your website is the hub of all of your digital marketing efforts. Effective advertising, social media, SEO, and PR all send people to your website. So, you need a well written site that clearly conveys the value that you offer and provides the information people are looking for. That’s how you turn visitors into customers, followers, or supporters. Heads up: if blogging is a tedious chore for you, it’s probably not riveting your audience either. Want us to do it for you? Our creative team loves writing. And we’re storytellers who know how to capture a reader. We take the time to learn about you and your work, so we can write authentically in your voice. We calibrate our work with your overall strategy, so it actually makes things happen—not just blogging for the sake of blogging. Flagship content is content that goes above and beyond, providing exceptional value to users. Examples include reports, guides, white papers, e-books, infographics, interactive maps—you name it. Flagship content can be an SEO powerhouse, drawing traffic and earning links. It’s also a good way to grow your email list, by getting people to sign up to access it. We’ll help you pinpoint where you can provide high-value content and make it great. What’s the best way for you to tell your story or share your expertise? We can advise you on options from video to infographics to podcasting. We’ll help you get the full SEO benefit of visual content and make sure your work finds the widest possible audience. For media we don’t produce in house, such as video, we can refer you to excellent creative professionals. You can often get great benefits by simply sharing interesting content from your partners, the media, or leaders in your field. We can help you discover, curate, and distribute the best content out there. Your audience will appreciate you calling it to their attention. When done well, this tactic helps you build relationships and establish your own authority. If you plan to write some or all of your own content, we can help you make it shine. We’ll collaborate with you to produce high quality work that’s achieves the goals in your content strategy. This often includes crafting your metadata and make other edits to make sure you get the full SEO benefit of your work. In addition to the JB Media Institute, we offer customized training in how to tell your story online, including how to optimize for SEO. We can help you create a content calendar and stay on track. We’re available to answer your questions and help you continuously improve. Amazing content only matters if people see it. 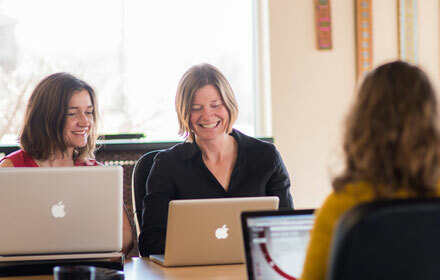 We’ll help you connect with your target audience through content distribution services that cover social media, email marketing, online PR, influencer marketing, and partner marketing.